This is a collaborative project where 4 research laboratories were part of it (LGC-CNRS, LBE-INRA, LECA-CEA, LEMIRE-CEA-UNIVERISTE-AIX-MARSEILLE) and 6TMIC. The project was financed by the National Research Agency, it started in 2010 and ended in 2014. The project proposed to convert organic acids produced by fermentation into hydrogen by taking advantage from the Microbial Electrolysis Cells Technology. The consortium gathered many scientific skills such as microbiology, molecular biology and electrochemistry in order to create and produce a laboratory scale prototype. The obtained information from those tasks allow to validate the feasibility to produce indirectly hydrogen from fermentable materials. Le project Défi H12 proposes to convert organic acids from the fermentation into hydrogen thanks to the contribution of a minimum of electric energy. An electrolyser will be developed in order to oxidise acetif acids and butyric at the anode while the cathode will ensure the abiotic reduction of water or the proton according to the pH value. Compared to the traditional electrolysis process of water, the electrolyser that oxide the organic acids need only to 0,2V (against 1V for the oxidation of water). For a production of a same amount of hydrogen, this new type of electrolyser will allow a reduction of the energetic cost close to 10. Our company carried out the entire conception of the electrolyser prototype. 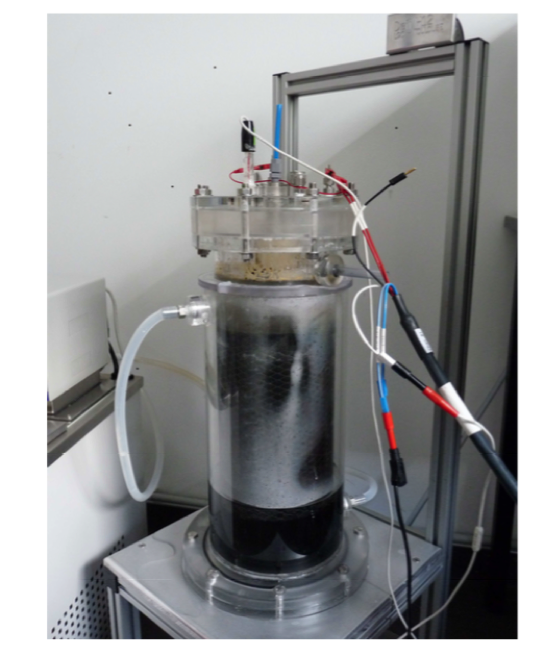 From intensity-potential curves obtained in laboratories from our partners, our research team created the design of the electrolyser and its optimisation (geometry of the electrodes, continuous or batch mode,fluid flow,material transfer).